Take the A1 motorway to Hengelo (Buren junction) and then the A35 to Enschede. Take the Enschede West exit (exit 26). After 450 meters, turn left onto the Westerval (N15). After 4 km you will reach a T-junction. There you turn left, onto the Volksparksingel (the Ring). After 600 meters, turn left through the Volksparktunnel and continue to follow the Ring. After 2 km, turn right at an intersection with traffic lights, onto Oldenzaalsestraat. our office. You can park behind the office. 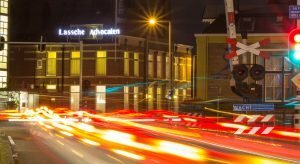 The office of Lassche Advocaten is located about 600 meters east of the train station, at the intersection Oldenzaalsestraat / Molenstraat, next to the Jozefkerk. You leave the station via the exit where the taxis are and follow the station square in an easterly direction. You then turn left after 100 meters, cross the railway. You then immediately turn right into the Molenstraat. After 500 meters you will see our office on your left, next to the Jozef church.